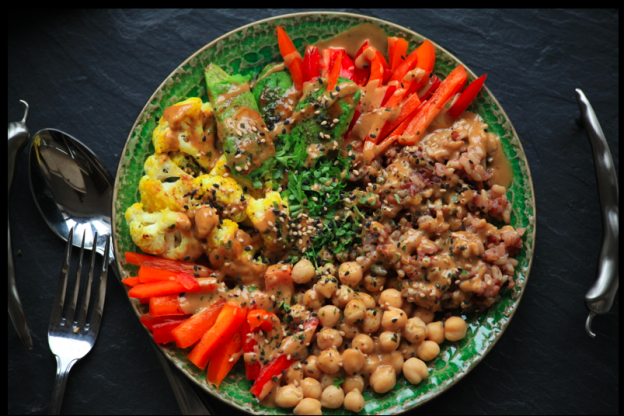 This week’s kitchen inspiration continues with a dynamic recipe for a goodness bowl from Mira Manek, the innovative chef set to revolutionise Indian food! Using her grandmother and mother’s trousseau of recipes, Mira is creating new and healthier dishes while retaining all the flavour and spice. She has done various menu collaborations (Holborn Dining Rooms in the Rosewood Hotel & Raw Press, Mayfair) and you can also find her healthy products in various cafes and delis around London. Discover more on her blog. Here, she shows us how to throw together a gorgeous, well-balanced Radiance bowl… Over to Mira. “The fabulous thing about this bowl is – it looks so impressive, it is just as delicious, and it is in fact so simple to make. What I love about goodness bowls is that you can be so creative with them, swapping and changing with whatever you have in the fridge. They look so colourful, vibrant and full of, nothing but, goodness. Hearty, filling and tasty! Start by cooking the wild rice in water on low heat – around 45 minutes. While this is cooking, chop all the vegetables and keep aside. Make a few cuts along the avocado and cook on low heat on a mesh pan so that it becomes slightly chargrilled. This should take only a couple of minutes. To cook the cauliflower, place oil in a small pan, add the cauliflower pieces, then the turmeric, coriander and cumin powders, and the salt, and stir well. Keep stirring until some of the cauliflower pieces turn a little brown. Don’t cook for longer than five minutes as you want the cauliflower to remain crunchy. Place everything in the bowl or plate in sections, arranging beautifully. Mix all the ingredients for the dressing and drizzle generously over the top. Sprinkle some furikake or sesame seeds along with a handful of fresh chopped coriander leaves and serve.